Future Mother’s Days Powered by Fair Trade Flowers? Giving a loved one flowers on a variety of occasions – Mother’s Day, Valentine’s Day, during an illness or as a sign of congratulations – is a time-tested winner of an idea. I have to brag that I often buy my wife flowers on a whim, especially when the weather is cold and cloudy (hello this past winter/spring!) and she (we) needs something to brighten up the house and her (our) mood. Shopping one day at Safeway, I grabbed a bouquet along with groceries and headed for the check-out. The lady at the till looked over my flowers and said “Is there an occasion?” My answer was: “No. I often do this.” She was misty-eyed the rest of the transaction, making me wonder if someone needed to buy her flowers (or if she had allergies!). Unfortunately, while cut flowers are really a beautiful expression of love and respect, their production often results in environmental degradation, health issues for workers, poverty and even conflict in the communities that produce them in East Africa and Latin America. In this article, I’ll focus on Kenya. So, taking Kenya as an example, flowers are produced, more for the European market, in what is a water-poor country. To hurry growth, flowers are force-fed water (laced with chemicals) and this has caused the emptying of key aquifers and even freshwater lakes, such as Naivasha. Add climate change and a quickly growing population to the equation, and one can see that the flower industry, while creating jobs, is contributing to major drought, hunger and poverty issues. Traditionally Masai grazing land, the Lake Naivasha region was taken over by white farmers during colonial times. It now hosts massive stretches of white plastic greenhousing. Three years ago, a drought followed by flash-flooding washed effluent and flower chemicals into the lake killing a large percentage of the fish. This led to a boom-to-bust situation. Many outsiders had moved into the area to take farm jobs but this disaster cut employment numbers as well as available food. Thus what followed was civil conflict which the world media described as tribal but was really economic. Long, hard working hours, the effects of chemical sprays, child labour and instances of harassment of women have added to concerns about flower production. These negative conditions worsen under pressure from peak seasons leading up to the special days in our Western culture where we tend to give flowers as gifts. On top of that, the fact that the profits gained by international florist companies don’t stay in developing countries to foster economic growth and offer sustainable livelihoods, and that companies often evade paying taxes, has given industry critics more transgressions to look into. The flower industry is now realizing that if they want their companies to survive overseas, they must follow more organic and fair trade practices. Cutting water usage is one step, but beyond that, paying taxes is recognized as a way of improving local infrastructure. The building of a system of local governance is essential so that pastoralists, farmers, fishers, local business and horticultural firms can find a way to work together for the benefit of all. One of the factors driving companies to take on new social and environmental practices is publicity, specifically of the bad variety. As buying flowers is a feel-good act, companies want to make sure that consumers feel good about their product. This has led to reduced use of pesticides in favour of biological controls such as ladybugs. Companies have moved to voluntary rather than mandatory overtime and more training, less abuse and more supervisory positions for women. Workers say that there is still much to be done on increased, livable wages and on acceptance of unions in the workplace. 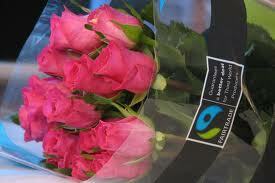 Fair trade flowers are still a relatively new item on the Canadian market. It has been a decade since the first certified flowers sold in Great Britain. Now, they are readily available on the West Coast and in large cities in Eastern Canada. Provincial groups, such as Fair Trade Manitoba, working with florist shops, have brought in special orders from BC but no store sells them yet on a regular basis. But this will happen soon as the fair trade movement in general continues to grow. The cut flower industry blossomed in the 1990s as part of an expanded global marketplace. It is now the second largest part of the Kenyan agricultural sector after tea, and Kenya is the fifth largest exporter of cut flowers in the world. Half of Kenya’s 37 million people live in poverty and estimates are that two million people are directly or indirectly dependent on the flower industry. If you do the math, an equitable, sustainable cut flower economy (fair trade, organic) will bring prosperity, health, education and peace to this usually volatile country.